Now that African states have decided to create a "Green OPEC", it is time to look at the biofuels and bioenergy potential of the continent as a whole. Assessing and projecting this biomass energy potential is extremely complex because there are so many factors at play. Some of those factors can be predicted quite precisely (demographic trends), for others this is far more difficult (e.g. climate change effects). The authors use a large number of factors and assumptions to calculate the technical potential that can be produced in a sustainable way, that is, by preserving biodiversity, rainforests and water resources, and without endangering the food security of people. If a 'business as usual' approach is taken - the unsustainable agricultural strategies still seen often today - then the potential would be much larger, but in that case the environmental effects become unpredictable and the damages might be irreversible. Another crucial sustainability assumption in the study is that food production matches projected demand, and that local food demand is given priority over export and transnational trade. The main factors used to calculate the potential are: demographic trends, the demand for food, fibre and wood products, and changes in land-use patterns. From these intertwined factors, the authors make projections about how much land becomes available for bioenergy production (that is: after food demands have been satisfied). A more detailed study of the quality of the land is then carried out and the arable land is divided into different crop suitability categories. This way, the potential can be assessed quite accurately. 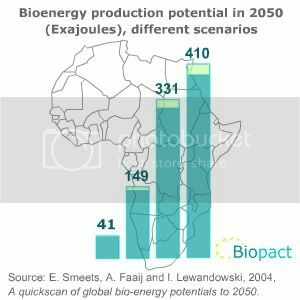 The conclusion of both studies is that the global, sustainable bioenergy production potential in 2050 is between 273 Exajoules (scenario1) and 1471 EJ (scenario 4). Now consider that the world's total current energy consumption from all sources (nuclear, coal, oil, natural gas and renewables) amounts to 440 EJ of energy per year. This means that under a high productivity scenario, the planet's potential to produce biofuels is several times larger than the total amount of energy we get from fossil fuels and nuclear today. Of all the regions studied, sub-Saharan Africa has the largest potential (max. 410 EJ), followed by Latin-America & the Caribbean (max. 252 EJ), CIS & the Baltic States (235 Ej), North America (max. 195 EJ), East Asia including China (max. 188 EJ), Oceania including Australia (max. 115 EJ), Europe (max. 44 EJ), Near East & North Africa (max. 39 EJ), South & South-East Asia including India (max. 38EJ), and Japan which has no potential. (1) The use of highly efficient agricultural techniques, which includes the use of modern fertilizers and pesticides. This is an optimistic assumption, because we know Africa has a long way to go on this front (as we recently reported in the context of the African Fertilizer Summit). (2) Irrigation is used on a very large scale. This too is an optimistic assumption, especially when it comes to agriculture in Africa where irrigation is virtually non-existent. Mass investments will be required in order to arrive at the maximum potential of 410 EJ. But it is possible; the study merely looks at the technical potential, not at real world requirements to arrive at using that potential. (3) Very efficient use of animal feed; many bioenergy projects are already integrated and contain a component for the efficient co-production of animal fodder. Again, the question will be whether such systems can be implemented on a large enough scale. These assumptions are global and abstract, and several of them are problematic in the context of Africa's potential. We just want to illustrate this with one example: it is highly unlikely that within 4 decades, the average intake of kilocalories by Africans will be as high as that of Americans today; let alone their intake of calories from meat! This implies that in Africa, less food and meat will be produced than the authors assume; this in turn means more land available for bioenergy production. This will be the reality on the ground. And it is here that a strategy has to be devised to give priority to increasing average African food consumption (in many countries, the average is below what is considered to be a minimum for human beings), over bioenergy production. Moreover, one of the most unpredictable factors that has not been taken into account, is the effect of climate change on the African continent. The few studies that have been carried out contradict each other: for example, some project the vast Sahel to become drier, others see it becoming much wetter. Since the Sahel region is so large, the actual climate change effects on it will determine whether there will be more or less land suitable for bioenergy than predicted. The same ambiguity holds for other regions in sub-Saharan Africa. One thing is certain though, even without the strict implementation of highly efficient agricultural techniques, without the need to lock up each animal into a cage as we do here in the West, without the need for mass irrigation,... Africa still stands to become a large biofuels producer. Even when the worst-case climate change predictions are taken into account. Link to the Smeets, et al., paper is broken. And now the link to the Hoogwijk thesis is broken as well. Hi David, a simple Google search immediately pops up fresh links to these (older) studies. Wade's words: the association "will be like OPEC"
African nations form "Green OPEC"